Looking for something new and unique to make with all the zucchini that you've harvested from your garden this summer? Then I have just the dish for you. 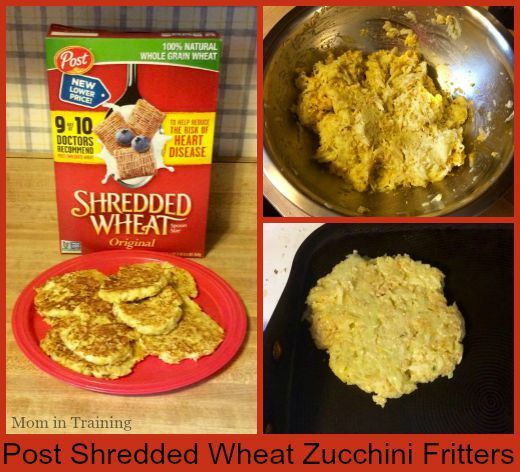 I recently got a box of Shredded Wheat cereal from Post and a recipe to go along with it for Post Shredded Wheat Zucchini Fritters. And let me tell you they were wonderful. The recipe calls for you to make a dill dipping sauce with them, but we ended up just having ours with sour cream and applesauce. Something we do with potato pancakes already. Before receiving my Post package I never would have even thought about using shredded wheat outside of breakfast. But now that I have a few boxes I'm actually pretty excited now about trying some of their other recipes too. You can check out the recipe I made as well as many others on the recipe section of the Post website. We have some zucchini now and I may just have to make this recipe. It sounds delicious. I never would've though to use Post Shredded Wheat as a coating.